Taglets.org is founded on the idea that no matter how brilliant you and your coworkers are (or think you are), there are always going to be smarter people outside of your company. That’s why it’s an API and platform first, so that people smarter than we are can exploit the platform in ways we would never think of. Originally, we weren’t even going to build a user-interface at all, but then we decided we needed something to demonstrate the platform and as a quick-start for non-developer end-users, and thus, we built the www.taglets.org website. However, the platform and API are still the focus. Twitter, Friendfeed, Facebook, and even the iPhone, have all demonstrated that an API is a powerful way to facilitate prototyping and innovation. The openness of the Internet itself is perhaps the world’s most successful example. It is with that in mind, that we have been working to provide some tools to jump-start development with the Taglets API. In the data entry field, you put the url of a script on your web site, such as http://myserver.com/myscript.php. When a comment is posted to that tag, the Taglets.org platform will invoke that script using HTTP POST with the tag name and comment as parameters (as though a user had typed them into a form and clicked ‘Submit’). The example shows how a script can capture the tag comments to store them, and later display them to users. Most importantly, it shows how to write a script that interfaces to the Taglets platform as a HTTP POST outlet. Get the PHP code here. Everyone (and every “thing”) following those tags at Taglets.org will receive the comment via the “outlets” they have specified, email, twitter, or HTTP POST. 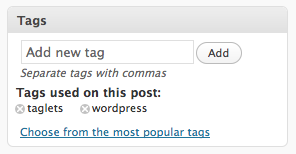 This “fixed tag” setting causes the plugin to send a comment to that specified tag, in addition to the tags specified with the blog post. 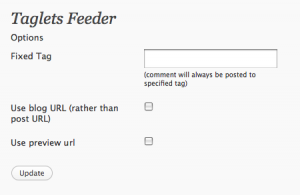 This can be used, for instance, to always send a comment to a tag named for your blog (e.g. “mrblog”), whenever you publish a new blog post. Of course the plugin includes the PHP source code and is released under the GPL to use as a base for anyone wishing to expand on it.